Réunion (French: La Réunion) is an island and overseas département ( département d'outre-mer, or DOM) of France, located in the Indian Ocean east of Madagascar, about 200 km southwest of Mauritius, the nearest island. Like the other DOMs, Réunion is also one of the 26 régions of France with the same status as those situated on the European mainland. 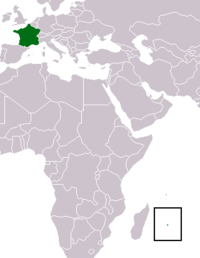 As part of France, Réunion is part of the European Union, and thus the currency used is the euro (in fact, due to varying time zones in the European Union, Réunion was the first region in the world to use the euro, and the first ever purchase using the euro occurred at 12.01 a.m., when regional council president Paul Vergès bought a bag of lychees at a Saint-Denis market)..
Arab sailors used to call this island Adna Al Maghribain ("Western Island"). The Portuguese were the first Europeans to visit the island, finding it uninhabited in 1513, and naming it Santa Apollonia. The island was then occupied by the French and administered from Port-Louis, Mauritius. Although the French flag was hoisted by François Cauche in 1638, Santa Apollonia was officially claimed by Jacques Pronis of France in 1642, when he deported a dozen French mutineers to the island from Madagascar. The convicts were returned to France several years later, and in 1649, the King of France Louis XIII named the island Île Bourbon after his royal house. "Réunion" was the name given to the island in 1793 by a decree of the Convention with the fall of the House of Bourbon in France, and the name commemorates the union of revolutionaries from Marseille with the National Guard in Paris, which took place on August 10, 1792. 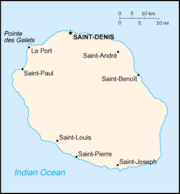 In 1801, the island was renamed "Île Bonaparte," after Napoleon Bonaparte. The island was taken by the British navy led by Commodore Josias Rowley in 1810, who used the old name of "Bourbon." When it was restored to France by the Congress of Vienna in 1815, the island retained the name of "Bourbon" until 1848, when the fall of the restored Bourbons during the revolutions during that year meant that the island became "Réunion" once again. From the 17th to the 19th centuries, French immigration supplemented by influxes of Africans, Chinese, Malays, and Indians gave the island its ethnic mix. The opening of the Suez Canal in 1869 cost the island its importance as a stopover on the East Indies trade route. Réunion became an overseas département of France on March 19, 1946. Between 15 and 16 March 1952, Cilaos at the centre of Réunion received 1,869.9 mm (73.6 in) of rainfall. This is the greatest 24-hour precipitation total ever recorded on Earth. In 2005 and 2006 Réunion was hit by a crippling epidemic of chikungunya, a disease spread by mosquitos. According to the BBC News , 255,000 people on Réunion had contracted the disease as of 26 April, 2006. The disease also spread to Madagascar and to mainland France through airline travel. The disease led to more than 200 deaths on Réunion. The French government under Prime Minister Dominique de Villepin sent an emergency aid package worth 36 million euros ($42.8M U.S. dollars) and deployed approximately five hundred French troops in an effort to eradicate mosquitos. Chikungunya means "that which bends" in the Makonde language of the Tanzania/ Mozambique border region where it was first identified. It can cause dehydration, extreme pain and high fevers and in some cases can be fatal. There is no known cure. The island is 39 miles (63 kilometers) long; 28 miles (45 kilometers) wide; and covers 970 square miles (2512 square kilometres). It is similar to the island Hawaii insofar as both are located above hotspots in the Earth's crust. Piton de la Fournaise, a shield volcano on the eastern end of Réunion Island, rises more than 8565 feet (2611 meters) above sea level and is sometimes called a sister to Hawaiian volcanoes because of the similarity of climate and volcanic nature, has erupted more than 100 times since 1640 and is under constant monitoring. It most recently erupted on July 20, 2006. 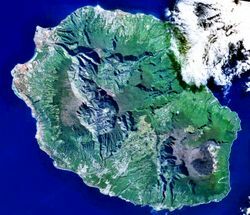 La Fournaise is created by a hot spot volcano, which also created the Piton des Neiges and the islands of Mauritius and Rodrigues. Sugar is the chief agricultural product and export. Tourism is also an important source of income. there is also many minerals in the mountains of the island, zinc, uranium, copper, silicon, are a few that can be found. Réunion contains most of the same ethnic populations as Mauritius: Malabars or Tamil, Vietnamese, African, Malagasy, Chinese and ethnic French - but in different proportions. Creoles, of mixed origins, make up the majority, about 90% of the population. Whites make up approximately one-quarter of the population, Indians make up 21% and people of Chinese or Vietnamese ancestry most of the remainder. The predominant religion is Roman Catholicism (86% of the population in 1995), with Hinduism, Islam and Buddhism also represented. Reunion has a very similar culture, ethnic makeup, language and traditions to those of Mauritius and the Seychelles. Reunion is currently experiencing an epidemic of Chikungunya virus. As of April 6, 2006, 230,000 people have been infected (29% of the population). Reunionese culture is a blend of European, African, Indian, Chinese and insular traditions. The most widely spoken language, Réunion Creole, derives from French, with many idiosyncrasies. Réunion Creole is now taught in some schools. However, an official orthography has yet to be agreed upon. Local food and music blend influences from Africa, India, China and Europe. Although the federal period installed a number of flags of metropolitan France, Réunion does not have a separate official flag. One flag was selected by the French association of vexillologists in 2003. It depicts the volcano of Fournaise, bedecked by gold sunbeams. It symbolises the appearance of populations who converged on the island at the turn of the century.